Tree removal can be a dangerous thing to attempt on your own, especially given how expensive mistakes can get when you need to call in a trained arborist to fix the damage. Essentially, the tree removal process has three phases: assessment, removal, and cleanup. At Lewis Trees, we offer these services as a bundled package that offers the best service possible at a reasonable price. Removing a tree is no small job and there are special considerations that need to be taken into account when removing a dead, dying, decaying, or hazardous tree. Our certified arborists not only have the tools and expertise to do the job correctly and efficiently, but they are also insured. This offers our customers some consumer protection in the unlikely event that damages occur during the process of tree removal. Stump Grinding & Removal – Typically, when a tree is removed, a small stump will be left on the property. A trained arborist will be able to grind the stump down so that it’s flush with the ground, removing any trace of unsightly remnants so as to minimize the impact of tree removal on surrounding plants, as well as maintain the aesthetic appeal of a well-groomed yard or landscape. 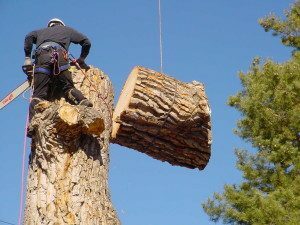 Do you need tree removal services in Santa Cruz, Monterey or Santa Cruz? Call us today at (831) 508-8995 with your questions, or if you’d like a FREE, no-obligation cost assessment! All estimates are given at no cost and require no commitment on your part–contact us today!